Today is the last Sunday in Lent before we enter Holy Week. It is not surprising, therefore, that our gospel story brings us to the very threshold of the events which would culminate in the Great Paschal Mystery of our faith. It is the eve of Palm Sunday. It is a perfect prelude to our celebrations and provides us with the necessary lenses to understand what is going to take place next week. Our guides are a group of Greeks who approach the apostle Philip and put this question to him, “Volumus Iesus videre.” “Sir, we should like to see Jesus.” The Greeks point us in the right direction. Who were these men and what were they looking for? The gospel tells us that they had come to the festival for worship. They may have heard many reports about Jesus, including the recent news that he had raised Lazarus of Bethany from the dead. Or they may have been brought to Jerusalem by their natural thirst for God. On this occasion, however, this natural thirst was transformed into a burning desire for a personal encounter. Their search would provide the setting for Jesus’ to set the stage for Holy Week. For Jesus “the hour has come,” the hour of his glorification, the hour where he must pass through the crucible of his passion and death, in order that His mission may bear fruit in a rich harvest. And you can almost hear the hour tolling in the background. Why were these Greeks looking for Jesus? We know that, in the gospels, people looked for Him for many different reasons. The Scribes and the Pharisees looked for Him in order to trap him in their theological quarrels. The Elders and the Chief Priests were always looking for Him to kill Him. Herod the Tetrarch longed to see Him, perhaps out of curiosity. Zacchaeus wanted to see Him because he was looking for one who might understand him. The crowds looked for Him because they wanted some bread and more miracles. The sick looked for Him in search of healing and consolation. Mary Magdalene looked for Him in search of forgiveness and out of love. Are you also looking for Him? The words of these Greek Gentiles mirror the desire to find some sort of “God” that is found in most if not all cultures throughout human history. There is in the heart of every human being a natural thirst for God, which nothing, except an encounter with Him, can ever totally extinguish. This thirst for God is felt by everybody, including those who claim not to believe in Him or those who have no name for Him. Notice how this thirst becomes more pronounced whenever we are in dire straits. In times of doubt, when we experience the darkness of prayer and the dimness of faith, we pray, “O God, I would like to see Jesus.” In times of bodily or mental pain, we pray, “O God, I would like to see Jesus.” In times of loss, when our grieving is unbearable, we pray, “O God, I would like to see Jesus.” It is clear that many of us want to see Jesus only because we want Him to solve our problems and, possibly, make our lives easier or even free from suffering. When the Greeks wanted to see Jesus, it was more than just his face, it was the man inside. It is what any of us wants of another, to reveal something of the true self, the inner being for which the face is only the exterior. But the desire to see the face of Jesus points to a far greater aspiration – being able to see God face to face. Of course, the Old Testament has the declared the impossibility of such an encounter. 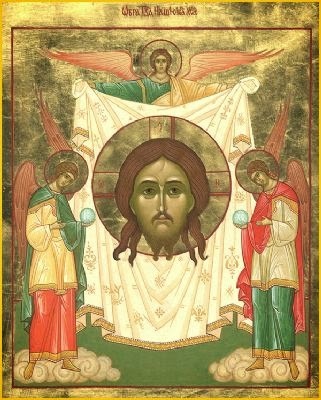 In the book of Exodus (33:20), God himself declares that “No man can see Me and live!” St Paul in his first letter to Timothy (6:16) further declares that God “alone has immortality, dwelling in unapproachable light, whom no man has seen or can see.” As long as we are tainted by sin, we cannot see God. Only in heaven, since we will be free from sin, will we be able to see God's glory unveiled in its fullness. God is therefore inaccessible to mortal man on a face-to-face basis. This is what made Christ's incarnation so wonderful: although no man has ever seen God at any time, to see the Son would now be to see the Father. God makes it possible for man to find Him and See Him in the person of Jesus Christ. What a breathtaking reality! Our desire to see Jesus is heightened today by the veiling of the crosses and statues; our senses undergo a fasting. However, this desire may be felt in different degrees. In some, it is so ardent that it becomes a conscious daily longing. In others, it is so faint that it is hardly noticeable, because it has been suffocated by other worldly substitutes. The consoling thing is that Jesus also wants to see us too. That is why He came into the world. As we seek to encounter Him, He also seeks to encounter us. And so, we pray, we plead, we beg the Lord for this one request, “we would like to see Jesus.” And so we will. If not with our eyes, at least with our hearts. Indeed we will come to see Him in the following week. We will follow Jesus into the city, to shout “Hosanna!” with those who welcomed him, to sit with him at table and hear that one of us will betray him, to follow him to the garden that night and then to the trial and on to the cross, and at last to the tomb, where he rise again and appear to us again, not as a stranger, but as a friend who breaks bread and offers himself to us at every meal and re-enactment of that great sacrifice of salvation. Yes, if you want to see Jesus, come to the table of the Word and the Eucharist, and you will find him there.